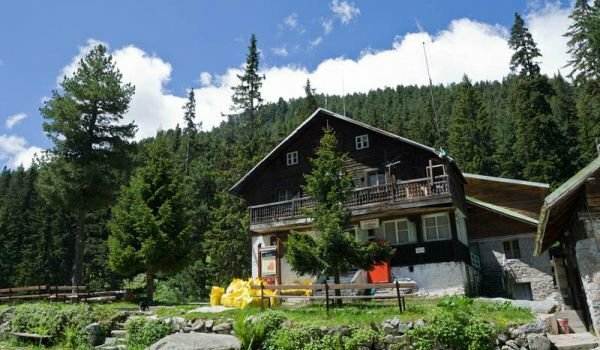 Demyanitsa Hut is located in Pirin mountain at 6216 ft (1895 m) above sea level, at the meeting point of the 3 rivers Strazhishka, Valyavishka and Vasilashka. Demyanitsa Hut is a large 2-story building with beds for 175 people and 14 bungalows with room for 42, in total - 217. Demyanitsa Hut gets power from its own hydroelectric generator, it has running water, plumbing, heating with solid fuel. The bath is separate. There is another building for the canteen, kitchen and pavilion. A restaurant and buffet are open year-round in the hut. There is a campground near Demyanitsa Hut, containing the oldest building in Pirin mountain. The road leading to the hut is accessible by car only during summer. The town of Bansko is the starting point for Demyanitsa Hut - 4.5 hours along a marked trail. Telephone: 0749 840 92; 0888 915 774; 0888 246 097.